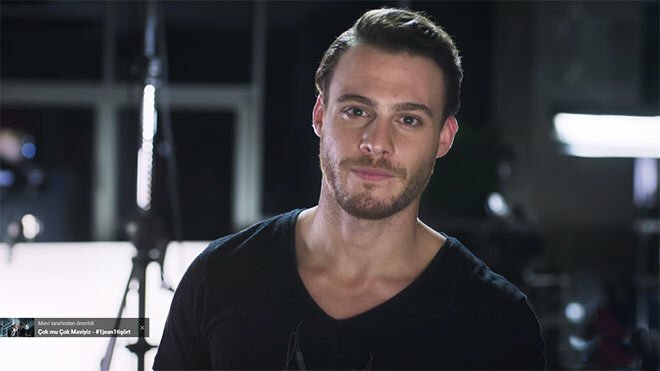 Kerem Bursin: A Brave and Romantic Star | Do You Know Turkey | Turkish Tv Series & Drama, Turkish celebrities, travel information about Turkey and Turkish cusine. Kerem Bursin is the latest star of Turkish television and cinema. Besides being popular in Turkish television, his career is not limited with tv shows, he also acted in international movies. Kerem Bursin is a handsome man, he has a well-built physique and combining with good acting skill, he stands as a strong character and so he has a lot of fans, of course women audience loves him. Kerem Bursin’s lifestory is different from many people. Kerem Bursin was born in 4th of July 1987 he growed in a multinational enviroment because of his fathers job, his family travelled around the world. Kerem Bursin lived in countries such as Scotland ( Edinburg ), Indonesia ( Medan , Jakarta ), United Arab Emirates ( Abu Dhabi , Dubai ), Turkey (Ankara, Istanbul), Malaysia ( Kuala Lumpur ), USA ( Texas, Boston , Los Angeles ). Finally in 1999, he settled in the Texas, United States with his family when he was 12 years old. In high school he founded a rock band with his friends and gave many concerts in Texas. After finishing high school in Texas, he moved to Boston for college education and took acting education at Emerson College. He moved to Los Angeles after college and he started acting. Since then, visited Turkey for summer holidays to his grandmother’s home. Kerem Bursin’s took acting education from Carolyn Pickman and Eric Morris. And he was discovered by famous producer Roger Corman, who discovered Jack Nicholson and Sandra Bullock. This was his luck, then he started to take roles from movies and advertisements. Kerem Bursin’s star shined in 2013 after his return to Turkey, he starred in the tv series “Güneşi Beklerken – Waiting for the Sun” with Hande Doğandemir. He became popular very quickly. In 2014, he starred in the movie “Whisper if I Forget – Unutursam Fısılda” with Farah Zeynep Abdullah which is directed by famous director Cagan Irmak. He played the character of “Yiğit Kılıç” in the Honor Issue and became a guest in the “Ulan İstanbul” series with the same character. Producer Roger Corman has appeared in television films Sharktopus and Palace of the Damned, in several independent films and short films. Being a handsome star, the eyes are always on you, so Kerem Bursin’s private life was always wondered. Kerem Bursin’s first publicly known girlfriend was Yağmur Tanrıseven, they started their relationship in during the shooting of Güneşi Beklerken – Waiting for the Sun tv show but the couple suddenly brake up in 2014. In January 2015, Kerem Bursin started a new tv show Bu Şehir Arkandan Gelecek – This City Will Follow You. Kerem Bursin played a ship worker named Ali Smith who has interest in martial arts and boxing and street fighter, so he take boxing lessons and fitness training. This was great for his female fans as you may see he had a rock solid body. In 2015 Kerem Bursin started to appear in Mavi Jeans advertisements as the face of the brand with Serenay Sarıkaya. Just two months after the ad campaign Serenay Sarıkaya and Kerem Bursin started dating and now in mid 2017 the couple is still together and seem very happy. Kerem Bursin is 30 years old and he is 1.79 cm height and 74 kg weight, his zodiac is Gemini.